The Victorian Laser Skirmish Association Incorporated is a not-for-profit sporting association that organises extended duration skirmish events for the passionate laser skirmish enthusiast in Victoria, Australia. The VLSA is powered by FragTag advanced combat simulation systems, providing non-projectile firing infra-red electronic taggers, variable damage and weapon modeling, extensive game customization, field resupply, simulated medical devices and other simulation accessories. Currently our skirmish events run approximately every 4-6 weeks, on a Saturday from 9am to 5pm, within 1-2 hours of Melbourne. The VLSA Commitee is made up of individuals from Geelong, Melbourne and Ballarat. We hold an Annual General Meeting once a year. All game fees are put back into the VLSA to buy new gear to further enhance the experience we can provide. July 27th: Pax Hill, Skirmish and AGM. Games are held every 4-6 weeks at one of the four fields. Registration starts at 9am and we leave the field by 5pm. We play two types of game, Skirmish days that we play at the smaller fields and CombatSims deployments that run a single scenario for the full day. We only have skirmish days a couple of times a year, they are a great introduction for a first time player and are also a good opportunity for regular players to try out a new role. We also occasionally run training scenarios to help improve skills of all players and these take place at the start of the day. Cost for a full days play is $40, this includes tagger hire. There is also a $10 membership fee that is payable at you first game and are due again at your first game of the financial year. If you would like to attend a deployment simply send us an email and ask to be registered for the upcoming game. We will reply and confirm your registration. You will be given a link to an online form that you need to fill in before you attend the game. The form will add your contact details to our membership database. It only needs to be filled in once. If you would just like to be put on our event notification list, send in an email and we will add you to the list. You will receive an email 3-4 weeks before each deployment and you can reply to that if you wish to attend. You may unsubscribe at any time. Further event details will be emailed in the week leading up to the event, make sure you read these carefully and are clear on the directions and arrival time. Water - 2-4 liters of water, in a hydration pack, water bottles or canteens. Food - Lunch and other snack to get you through the day. It's a good idea to carry something with you at all times like nuts, lollies or bars of some sort. Clothing - Sensible clothing to suit the weather of the day with extra clothing in case of wet/muddy conditions or to change into at the end of the day. Long pants and shirts are recommended to protect the skin, browns and greens work best if you have no camouflage clothing. Some camouflage clothing is available free of charge for the day. Personal supplies - Bring with you any medication and first aid supplies you may need (Band-aids, Panadol, bug spray, sunscreen, Ventolin if you have Asthma, etc). Also personal wipes for removing cam paint or other sanitary needs. Rowallan has a central toilet block as well as showers, sinks and tap water available. Jubilee has almost no onsite facilities. A bush toilet is located at the field and basic toilets are located a short drive away. There is no tap water on this field. Haddon has a central toilet block, as well as tap water. Pax Hill has 3 toilet blocks, showers and tap water. Mobile phone coverage - Telstra coverage is good, Optus is ok in some parts. There is no electricity on any site. Radios - Radios are used by admin as well as teams to communicate with each other. Players are able to bring their own radios and use them in games. 0.25 Watt radios are fine for inter-team communication. 2-3 Watt will cover the field ok and admin use 5 Watt to ensure reliable communications. 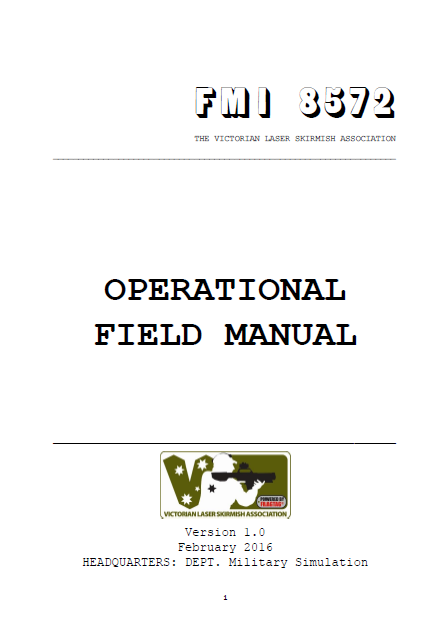 Click on the picture to access the most up to date version of the VLSA field manual. This document was written as a tool for existing members to refer to when needed and for potential players to explore when considering attending one of our events. These positions do not require any previous experience, just a willingness to learn and have a go. They are admin members, their role is to run the game, handle technical issues and perform respawns (casevac) of any dead players. The boss of the section whose role is to make decisions and give orders to the rest of the team. Supports the Secco and takes command if the Secco is out of action. The medic carries the section simulated med box and is responsible for issuing simulated first-aid to the wounded in order to keep the section in the fight. The scout is responsible for taking first position in a section formation, they are required to lead the section to their rendezvous or mission objective. The Section Gunner is responsible for heavy firepower of the section with the use of a M249 Squad Automatic Weapon. In addition to the standard rifles (Predator and R1), players can be issued with more specialised weaponry to match their selected role. These include the Vintorez or SL8 marksman rifle, the M249 SAW, Stoner LMG and claymores.